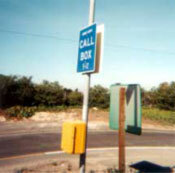 Callboxes can be found on all major freeways in LA County. If you are stranded on the freeway and need assistance, find the nearest callbox and open the callbox’s yellow door. Then simply pick up the phone and you will transferred to a freeway assistance specialist. All LA County callboxes are also TTY equipped for the hearing impaired.